The Bible Doctrine of Inspiration. This is the most important section of the entire course of Bible Doctrines 1. Get this right and you will have the very heart of teaching and preaching with absolute authority. The remainder of this course has been revised (2013) from the original transcription of 1977 audio tapes. This was done in order to reflect the author’s own growth (hopefully) in Bible understanding and to correct as well what I see as inconsistencies of the modern “KJV Bible Believers” movement. The student will notice some clarification and extended comments on the term “inspiration” and its relationship to “preservation”. God’s word never changes, but if we do not continually learn and have spiritual growth in the things of God, we become as clouds with little water. As a whole, all of us have allowed the idea of inspiration to be confined to the original manuscripts only, while using preservation to remain in the nebulous area of various manuscripts, propped up entirely by the immense number and the usage of them. Perhaps we used this, wishfully, to “prove” we had the very words of God; it is not essential. The word of God does not allow preservation of its words to be totally dependent upon godly men or the vast number of manuscripts, which are in the same family, or generally alike. As I see it, that idea has been simply an attempt to meet the so-called “scholars” halfway in order to retain “verbal-plenary” inspiration of the Book in our hand, and not look as though we were ignorant and unlearned men. The number of manuscripts that agree are some confirmation of preservation—but that is not the critical factor. The following comments will surely raise the hackles on many AV1611 backs, but so be it. I hasten to say these things were not learned overnight and that I remain a student who seeks the approval of God alone. I am closer to the Judgment Seat of Christ than many of my readers—this makes me “cut the bull” and do my best to speak the truth in love. A reluctant and rebellious boy and made to go to church by my mother, baptized at twelve, I was well on my way to hell at eighteen believing in God just like the devil believes. By the grace of God I married a good saved woman and through her prayers and Bible living, stopped looking for peace in the beer joints and hell-holes. I accepted Jesus Christ as my own personal Savior. I saw I was a sinner and that Christ died for my sins. For the first time I knew why He hung on that tree and that salvation was not in any church or system but that salvation is ONE PERSON, JESUS. Saved in 1963, at this writing I am 75 years old with 51 years behind me in what men call “the ministry”. I did not want to be a “preacher”, seek it, and was fearful of it when I read the same Book in 1963 that I have today. God would not leave me alone! I was like Amos: “I was no prophet, neither was I a prophet’s son…” (Amos 7:14). Every place I read in the Book it seemed God said to me “Go tell them what I’ve done.” Over fifty years later, I am assured I did the right thing. Let’s be clear: I do not say a person should not read books, study, and get the best preparation you can. This is a Bible school course! I am certainly not opposed to the right kind of education. I went to schools and got a string of degrees behind my name. (But like a man said: “More curls in a pig’s tail doesn’t make the pork any better.”) God kept me on the main track. When a professor or preacher corrected the word of God, I let the Bible in my hand with its words correct him. I fell for some tricks along the way (we all do) but I believe the grace of God got me out of them before any real lasting damage was done. Another thing is important: do not despise the days of small things. You may be an ex-Roman Catholic that is now saved. Your mother may have carried you to Mass, a Mosque, or to a church like my mother did. There’s some truth in many things. You wont go to heaven based on looking at a bug in a microscope but there is the truth of God in its design. You won’t become a Christian by sitting on a church pew anymore than you could be a car by sitting in a garage but there is some truth in many places and things. When I was a boy, I saw a picture of Christ on the cross in church that stuck in my memory and as I played music in the nightclubs, that picture would flash across my mind. It was a constant prick in my conscience. You may have been raised in Buddhism but even in that religion there is a witness, one thing is sure, it shows that God has put the desire to worship in all men; the difference lies in Whom you trust and not the label around your neck. You may have graduated from one of the colleges, universities, seminaries, or Bible schools that professed to believe the Bible or that freely corrected it, or didn’t allow the Bible at all, but that is no reason to trash the school. If you are honest, you learned something that you needed. If you got absolutely nothing—you are hopelessly immune to ministering to a lost world and doomed to an isolated sinkhole of self-centered love. The point I make is don’t become negative, sour, a person down on everybody and everything who does not agree with what you think you know now. The best of us are all students in God’s world and word. Love your mother and father and your fellow man for the good in them; that does not mean you agree with everything they have ever done or are doing. Spitting on a man or kicking him in the gut because he is not doing what you think he should, will not make him respect or listen to you. This is a personal illustration. (After 50 years in the work, a man should have personal illustrations and not have to read all of them out of a book.) My father was unsaved when I accepted Christ. He came from middle Tennessee and had made it on his own since he was an orphan baby. He was rough, tough and ready. He was respectful to preachers but laughed at two great “soul-winners” who tried to win him. (The men were pastors at that time of the largest Baptist churches in the world.) They were sincere and did the best they could, but that didn’t get him. What got him was something else, 30 years later. He had thrown up a prayer to God in 1971 to heal our baby boy (Micah) who had a heart problem. He said “God, if you will spare the baby’s life, I’ll get right.” I didn’t know it at the time, but he was watching me to see if what I professed in 1963 had really changed “the wild side of me.” Early in those years, while I was following the “standards” set forth by my school, I made the mistake one day of criticizing his cigar smoking. He left our house and didn’t come back for 6 months. One day, I realized God didn’t save clean, non-smoking, good living, outwardly religious clones—He died for sinners! I apologized to my father for my stupidity and realized how thankful I should be for his good qualities. He worked hard, paid his bills, and his word was gold. He taught me how to properly handle a gun, give a honest day’s work for your pay, work hard, keep your word, and tell the truth. But even if he had not done those things, he was still my father. A haughty attitude will eventually catch up with you. There is a former student who knew almost nothing about rightly dividing the Bible when he began Bible school. He knew nothing about the real Bible translation issues. He learned a little, copied this and that from one man and another, floated a loan and published a couple of fancy books. Impressive to some who don’t know the facts, yet his testimony among many is that of being a self-promoter and very egotistical. He gives no credit to anyone and constantly gives notice of where he has been on radio and TV, etc. All of it is smalltime showmanship and not a few openly laugh behind his back. He is a perfect example of one who glories as if he did not receive anything from another man. What this man does not know is that he benefits from giving honor to whom honor is due—those he plagiarized don’t really benefit from his honor, nor do they seek it. God help us to give honor to whom honor is due! The man or woman that you honor does not receive the greatest benefit—it is for our own benefit. All of us receive what we have from other men. God’s revelation is complete. He does not reveal to me or to you what other men do not know or have known. We may think we originated it but it has been around a long time. Just because we “find” something in the Bible does not make you or me a “revelator”. It was there before we took our first breath. And, most likely, it was in a book or lesson by some man long ago. I learned first from my mother and father. Three brothers, men and women, friends, pastors, —folks I’ve only met in a book—and some saved, some lost, teachers. All truth is in the Bible and not all truth is outside it. 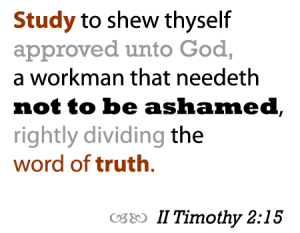 But where there is truth outside the Bible, it is still God’s truth. Recently, a friend of mine shared something on his heart as we drove around the Colorado hills. As I listened to him, I realized he was helping me learn a spiritual truth that I did not have before. I have three earned doctorates: he has none, but he was my Bible teacher for those four hours we rode together. I learned more about mission work in two months from a lady in the Venezuelan jungle than I learned in 20 years in the ministry! Lets keep an attitude of gratitude and realize we may know some things but we know nothing yet as we ought to know.